Do you wash your hands EVERY time you use the restroom? How about before you eat? 95% of Americans say they do. However, only 67% of Americans actually wash their hands as shown in a study conducted by the American Society for Microbiology. So, many people say they wash, but in reality, many less do actually wash their hands. Washing your hands is one of the best ways to keep yourself from getting sick. Germs are tiny things that you cannot see with your eyes that might make you sick. Not all germs are bad; most are actually beneficial to humans, but some can cause illness. For example, germs cause the flu and common cold. All surfaces have germs on them including foods, animals, and anything that comes into contact with people. Can you think of a few surfaces or objects that pass through the hands of many people or that people touch often? Many people believe that the cold is passed on by coughing or sneezing. You have probably heard others tell you to cover your mouth when you do those things, but if you use your hands, make sure to wash them right away, as they will pass on the germs to all the surfaces you touch. Instead of using your hand, you should use your arm or tissue paper because it does not touch as many surfaces as your hands. Most cold germs are spread through hand-to-hand contact and direct transfer of germs from your hand to your mouth. In this experiment, you will find out why washing your hands is so important in keeping you healthy. You will also discover the best way to wash your hands so you rid them of all germs. Discover how to wash your hands thoroughly. Understand why washing your hands are important in keeping you healthy. All steps in procedure should be done under adult supervision (who can be the additional person). The following will be repeated once using soap, once without soap. When using soap, add a little bit of soap each time you wash. It is essential that the person washing their hands not take off the blindfold. They will see how well they did on the poster board or pieces of white paper. Have one person cover their hands in about a teaspoon of paint somewhat evenly and blot their hand on a piece of white paper and label it "zero seconds." Allow hands to dry for a minute or so. This will be your control, the part of an experiment in which all your data will go off of. Let's say that the paint covers all of their hand, so it has 5 out of 5 on a rating scale. 5 means there is a lot of paint on, 3 would mean their hands have half the paint on, and a 0 would mean there is no paint on their hands (they are clean). Blindfold the person who is washing their hands so they cannot see anything. Have the person not washing their hands turn on the water to a warm temperature. Wash the painted hands for one second (count out loud "one-one thousand"). Have the timer partner lead your hands to where the water is coming out. They will determine how much paint there is using the rating scale 0-5 and record it in the table below. Blot the dirty hands on another piece of paper or on the same poster board and label it (be careful not to rub or smudge the paint). Do not let the person washing their hands take the blindfold off to see how clean their hands are!! Wash their hands for 4 more seconds by having the timer partner use the stop watch. The timer person will blot and label it under the 5 seconds column (because the dirty hands have been washed a total of 5 seconds now). Wash their hands for 20 more seconds, blot and label it under the 25 seconds using the ranking system of 0-5. Repeat the above steps using soap and labeling the blots correctly like the picture on the right shows. Clean up the area you used. Now look at the blots you made and the chart above. Which is the best way to wash your hands? 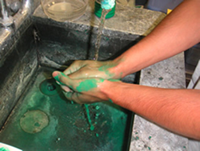 Are the paint particles representative of germs on your hands? Make sure you check out the sources listed below to find out even more information on germs and washing your hands. Repeat the above experiment with cold water and see how it affects the results. Why do people always say use hot water when washing your hands? If you used antibacterial soap, use regular soap (not antibacterial). Is there any difference in the results? Does regular soap get rid of bacteria or germs as well as antibacterial? It is important to wash your hands thoroughly because it will remove all the germs from your hands, lessening the chances of getting sick! You can find more information at www.washup.org.